With the passage of time the attention towards employee turnover’s relationship with organisational profitability has increased. More number of researchers and managers are gaining their interest on this topic. Likewise, the focus of the following research is to deliberate on the impact of employee turnover on the profitability of the organisations specifically based in UAE. The employee turnover in organisation is a major issue that has a potential to lead an organisation towards inefficiency and performance as well as profitability downturn. Numerous organisations throughout UAE are facing the challenges associated with employee turnover due to the dynamic nature of businesses in the present world. It has become a major subject matter and issue for every organisation to retain their employees and thus this factor is resulting in the loss of productivity and simultaneously decreasing the profitability no matter the business in multi-national, small or medium scale. For the Purpose of this research study, data has been collected through primary data collection method. Closed ended questionnaires have been used to collect the responses of the participants. The results for the purpose of this research study have been interpreted through descriptive statistics and regression analysis. The research study concluded that employee turnover does affect the organisations profitability. The top management should come up with the innovative approaches in order to seek out the discussed issue. I ____________hereby notify that, this research study is the fruit of my own efforts and has not been copied from other sources. This work has been produced after extensive research, and I have conducted in-depth analysis on the topic that is Impact of Employee Turnover on Organisational Profitability. The attention towards employee turnover’s relationship with organisational profitability has increased with the passage of time. More number of researchers and managers are gaining their interest on this topic. Likewise, the focus of the following research is to deliberate on the impact of employee turnover on the profitability of the organisations specifically based in UAE. The employee turnover in organisation is a major issue that has a potential to lead an organisation towards inefficiency and performance as well as profitability downturn. And this issue is still prevalent in numerous organisations globally including those several organisations working in UAE either domestic or international. Even the nation that is working with sustainable economic conditions and are highly developed the existence of employee turnover is still influential. The level of organisational activities or the capability of effort completed by the workers will only be attained if the employees are contented by the workplace environment. The conditions of Employee turnover rate issue in UAE are getting severe with time and it measures around 25 to 30 percent that is an extensive amount and can be recognised chiefly to declining employee loyalty. Employees seem eager to switch their jobs for a minimal salary increase, increasing expenses for their present manager when finding and recruiting another employee. Recruitment and enduring expenses comprise visas, accommodation, and foodstuff for employees and training. According to Rettab et al. (2009), it has become significantly important for organisations to diminish the risk associated with employee turnover in a way that is profitable for all stakeholders, however mainly for the managers of the organisations. The consequences of employee turnover vitally comprise the incapability to make certain the steadiness of information sharing in an organisation. With the following understanding of information sharing, employees in any organisation are deliberated as the significant beneficial asset that has the potential to lead an organisation towards not only the achievement of goals but also sustaining a competitive edge. The skills, understanding, know-how and the ability to share information from one employee to another are achieved through a numerous efforts of an organisation that are not only cost consuming but also time and efforts consuming. Thus, an organisation would never wish to lose its assets unless it is required. These organisations immensely devote a massive sum of cash for training and development practices. Ali et al. (2010) specified that “organisations conduct diverse training programs including seminars, internal, on-job and outdoor training with a simple aim to progress the ability and competencies of their employees and thus upsurge the productivity. Though, still there comes a time when these employees intend to departure from the organisation once they have increased their capabilities and knowledge”. It is understood that such training programs, compensations and benefits programs leads towards employee contentment and decreases employee turnover that as a result let the execution of satisfactory provision principles at ranks of positions which are vital for excellence of work. Through the perception of Human Resources managers, the concept of employee turnover is assumed to be the degree at which an organisation’s employee base dismisses work and necessitates employee replacement (Combs, et al., 2006). Various organisations are prosperous in their activities due to the extent of efficiency the organisations possess to retain their workers. Retaining the workforce instead of losing them, nevertheless, is not accomplished as easily as it may seem. Prosperous organisations in this subject matter are those whose managers have acknowledged and positioned the processes including compensation, training and career development and other such customs of motivation thus in order to boost the capabilities of employees, gain higher level of trust and loyalty, and retain the employees in the organisation for an extensive period of time. This supports in ensuring stability in the productivity of labor. On the other hand, those organisations that are unable to ascertain the strength of their workers and compensate them accordingly result in the loss of these employees in the organisation. This in return decrease the overall performance of the organisation, its growth and upsurges the expenses associated with hiring new employees, their training process and the development of new workforce to occupy such opportunities. Higher employee turnover, consequently, affects the organisational performance directly (Lee, et al., 2004). Besides, Guthrie (2008) in their study determined that employee turnover is also understood as a proportion that depicts the degree at which workers move in and out from a particular organisation. Though, this amount most probably signifies both controllable turnover (the one that can be controlled by the managers) and the uncontrollable turnover. Turnover can be purposeful in which the employee’s exits is beneficial to the workplace, or it can also be dysfunctional in which the retiring employee can be the one who was highly beneficial for the organisation to retain. Highly skillful and efficient employees that are hard to substitute signify dysfunctional turnovers whereas those who are low on skills and proficiency remain easier to be replaced and signify functional turnovers. The critical concern in examining turnover, consequently, is not how many workers are departing but the proficiency and irreplaceability of the departing employees against the ones that are continuing to work. Noe, R. A., Hollenbeck, J. R., Gerhart, B., and Wright, P. M. (2006) moreover established that being a manager of an organisation, employee turnover is a vital matter that requires strict assessment and monitoring to stay updated with the changing practices. It has become significantly conventional that operational prearrangement of the resources in an organisation is associated with the labours and the materials source; this indicates that the administration of an organisation is partial and inefficient if any of these two factors are missing or less effective. Though, human resources will be deliberated in the matter of employee turnover in a workplace due to the issue that the continuous departure of the employee can lead towards organisation’s increased risk in their procedure and efficiency. The efforts of human resource management are apprehensive towards each facet of how individuals are hired and managed in the workplace (Egan, et al., 2004). The tactical professional function structure of the organisation realises to the arrival and departure of people in the organisation. The Human Resource role of leading the organisation structure to make certain that human capacities are used efficiently to achieve anticipated objectives is highly critical. Organisations eagerness towards development would constantly aim to progress their particular present human assets and other capabilities. But today’s world has become highly dynamic and requires frequent improvements in the processes incorporating technological and innovative implementations in the workplace and other processes. Organisations would constrain themselves in the direction of attaining their staff to the mission necessitating rational and physical development and increase. The notion behind this would be to strengthen the supplementary efficiency produced by additional worker employed. All these mutually would aggregate to organisations remaining expense conscious in making certain that staffs with greater capabilities do not intend to depart from the workplace. However in order to be progressive and career oriented, organisations might be much of importance to few employees. No matter how much effort an organisation puts in to retain employees, it is probable that few of them will ultimately leave. The purpose to conduct the following research is to study the impact of employee turnover on organisational profitability particularly in the context of UAE. The primary aim of the following research is to assess the effect of employee turnover on the organisational profitability and productivity. Along with this the secondary aim is to highlight the factors required by the organisation to examine the growth and decline within an organisation. &check; To investigate the impact of employee turnover on the profitability of the company. &check; To explore that how employee turnover is limiting profitability of a company. &check; To investigate the factors required for decreasing and increasing the level of employee turnover. &check; To determine whether employee turnover alone is sufficient to improve the profitability of the company. &check; What is the impact of employee turnover on the profitability of the company? Employee Turnover:It is a level or percentage of employees that are departure, dismissed or left an organisation and require replacement (Zeffane, et al., 2008). Organisational Profitability:It is a business that is capable enough to earn more yields or returns then they spend to carry out the objectives of the organisation. Such organisations incorporate highly skilled labor force and efforts in spending on their employees in order to achieve the identified goals (Combs, et al., 2006). The following dissertation along with five chapters aims at presenting with the impact of employee turnover on the organisational profitability. Thus, the research will be carried out through attaining primary data by the method of self-administered questionnaires and secondary data collection by studying and deliberating various articles under the heading of literature review. Further, complete data and explanation of the methods incorporated to complete this research will be provided. Following will be the discussion of the analysis of data that will be measured through the identified methods. Finally, the research will conclude the paper with results of the discussion as well as recommendations for further study. Numerous organisations throughout UAE are facing the challenges associated with employee turnover due to the dynamic nature of businesses in the present world. It has become a major subject matter and issue for every organisation to retain their employees and thus this factor is resulting in the loss of productivity and simultaneously decreasing the profitability no matter the business in multi-national, small or medium scale. Similarly, few cases employee turnover might be required by the organisation in order to avail new opportunities towards innovative and technological development, initiate new capability, knowledge and proficiency in the workplace and offering increased prospects for career development for prevalent employees. Even though there are high costs associated with employee turnover for few organisations (Suliman & Al Kathairi, 2012). Thus, the following part of the research aims at discussing the subject matter in the light of prior researches to critically evaluate the relationship between the two identified variable according to the articles of other investigators particularly in context of UAE. Employee turnover according to Suliman & Al Obaidli ( 2011) is mainly affected by various factors, nevertheless, it is frequently associated with the influence of organisational concerns. Moreover, Iqbal (2010) stated that for the determination of emerging developments and basis for a resolution sometimes necessitates a reassessment of the workplace’s processes and strategies (Combs, et al., 2006). Thus Guthrie (2008) further explains that it becomes high complex for the managers of these organisations to carry out the processes with an amount of purposes and rigidity required, and in addition, it is worthy to cultivate a team of people from external environment of the organisation to come and perform this reassessment and turnover process in the organisation (Suliman & Al Obaidli, 2011). Maertz, Griffeth, Campbell and Allen (2007) explained that the staffs frequently move to other organisation with a determination of attaining high turnover, and it is also exposed that the organisation that work in providing higher incomes are higher profitable in the competitive marketplace than those to pay less income to their employees. These activities are frequently reflected at the financial level, from managers and generously paid specialists in new posts to high-stress jobs staffs in comparatively simple jobs. Thus, Glebbeek & Bax (2004) further explained in their study that employee turnover is the replacement of labors from one place to another in the employment market; among businesses, occupations and employments; and amongst the situations of employment and joblessness. Holding employees and the efforts organisations put in to retain them is a prime issue for most of the organisations throughout existences of knowledgeable assets. An argument about work and its communal role is accessible by (Egan, et al., 2004). Employee turnover can be costly from the outlook of an organisation (Suliman & Al Obaidli, 2011). The higher level of turnover results in greater expenditures associated with hiring and training new staffs. It costs companies cash to employ human resource employees to interview and employ applicants and training new labors can be an expensive procedure that distracts experienced employees from profitability performances as suggested by (Rettab, et al., 2009). Knowledgeable employees who have to habitually train new employs are a lesser amount of talented to distillate on their regular job responsibilities (Ali, et al., 2010). Employee turnover according to Ongori (2007) is clustered into diverse types. The voluntary is commenced by worker. When worker select or planned to from the organisation they work in they chose to leave or switch job by them. Involuntary, on the other hand, is when worker is left with zero options to select from and has to go through the termination from the organisation with or without their consent. Such situations can come across in various different ways including; firing, retirement, physical/psychological debility, switching/transfer etc. although these both situations are apprehensive towards the departure of worker; and thus it necessitates diverse decision-making management practices (Ongori, 2007). The departure of immensely skilled and proficient worker from the organisation raising the difficulty of replacement of skills and knowledge that in return corrode the organisation’s labor force and points towards the high turnover cost is known as dysfunctional (Ongori, 2007). On the other hand, functional turnover is the departure of ineffective and less competent employees whose skills are easier to be replaced (Ongori, 2007). 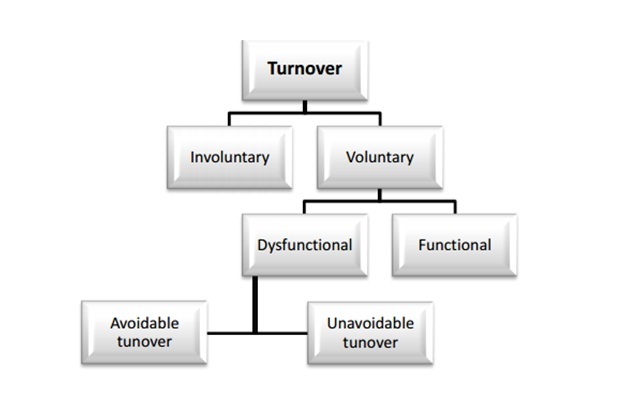 Avoidable turnover is reasons that the business may clever to sway or tackle it (Ongori, 2007). For staffs that exit the workforce due to low job gratification, difficulties of misconduct, compensation etc. can be recollected through refining the stated management doings (Ongori, 2007). Unavoidable worker turnover stanches from reason over which the business has slight or no control over (Ongori, 2007). Currivan (2010) explained that usually, all expenses correlated to the departure and replacement of staffs can be measured to be expenses of labour turnover. These hold not just the expenditures of staffing and assortment. Awadh & Ismail (2012) further put forward a relatively wide-ranging list of turnover costs with objects such as promotion, college employing, interviewee’s travel expenditures, medical investigations and mental analysis, staffing rewards for personnel, and other such factors. The costs of these substances are thus accounted for, and the similar approximately grasps for the damage of organisational transactions because of job openings and greater average salary due to additional overtime. From the investigations of the article of Ibrahim & Perez (2014), it is apparent that employees’ turnover inclines to be progressive in surroundings where labours feel that the organisations are taking advantages from them, moreover in a workplace where they feel undervalued or disregarded, abandoned or unimportant. O'Connell, M. and Kung, M. C. (2007) indicated in their study that lack of attention paid towards the employees leads an organisation towards the loss of profitability and effectiveness. On the other hand, it is also apparent that the businesses would not attain a great amount of sustainability and efficiency in the establishment till they acquire the capability to propose positive mean and possessions to the staffs in a way that they decrease their stresses and take the organisation in a direction of attaining organisational profitability. Conversely (Awadh & Ismail, 2012) stated that it is also apparent that the administration establishments of the businesses would not direct the firms in the direction of the level of productivity in anticipation of classifying their higher authority for action taking and approval. According to Ramlall (2003), it is also seen that the managerial profitability is influenced by the extent of employee turnover. The finding of the study by (Suliman & Al Kathairi, 2012) proposed that if the workers’ turnover in the organisation is greater and complex, then it will definitely lead the organisational effectiveness to the greater weakening level and if the turnover of these employees is minor than it would lead the effectiveness and efficiency of the businesses at the greater level. The risks associated with employees turnover has the ability to damage for large, medium and small businesses. All administrations can anticipate some amount of turnover among their employees. Certainly a definite amount of staff’s turnover might be necessary as it generates prospects to the lead capability, new philosophies and understanding to the business, as well offering career growth prospects for current employees. Hurley, R. F. and Estelami, H. (2007) indicated that the turnover is nevertheless, has a significant effect on the productivity on an organisation as it increases the costs as well as decreases the dependency factor on the employees. The new employees that will be hired in the place of previous experienced employees will not deliver the level of productivity that is required by the organisation for a longer period of time. Thus, this will lead the organisation towards lagging behind in the competitive world. It also disturbs ethical, effectiveness, competence and overall output of the organisation as stated by (Suliman & Al Kathairi, 2012). O’Connell & Kung (2007) moreover signified that labour turnover might occur because of a specific reason nonetheless they can also be a sign of further central structural difficulties. Numerous workers in diverse companies of UAE are identified to exit their workplace for the reason that they were undergoing many internal and external difficulties. Diverse authors explains that staffs leave their jobs because of their managers, absence of faith, lack of interaction or understanding, partial or biased behaviour of the higher management, low salary, tough or stressing working conditions, and other such factors. Due to this, administrations let their consumers and purchaser experience reduced functioning arrangement or declined efficiency (Glebbeek & Bax, 2004). Companies operating in UAE are a relatively higher expense on the procedure of training and development of employees in order to increase their profitability to attain the organisational goals. Thus (Egan, et al., 2004) specified that the normal yearly training costs per worker stretch to 3507.62 UAE dirhams. Consequently, it is understood that training has an element, issue and businesses comprehend the influence that training has on their workplace. Glebbeek & Bax (2004) modern active and constantly developing competitive world, ample technology, information, sustainable economic conditions, and international presence, has altered the significance of human resource in the workplace. As training and development is a prearranged process through which worker of an organisation increase their skills and capabilities, for freshly employed worker training is a business or alteration from hypothetical methods to applied condition. And for skilled worker it is a procedure of redevelopment to encounter the further job necessity (Hurley & Estelami, 2007). It facilitates staffs to coup-up with promptly altering skill and the business to achieve competitive benefit through its trained or capable work force. Through the understanding of training processes, (Suliman & Al Obaidli, 2011) explains job satisfaction as an optimistic expressive state causing from assessing an individual’s job understandings. Job disappointment happens when these prospects are not encountered by an employee. If a worker anticipates hygienic and harmless functioning circumstances in the work, then the worker is probable to be discontented with the job if the environment is unclean and hazardous. Job satisfaction has numerous scopes. Frequently distinguished features are gratification with the labor themself, salaries, and appreciation, relationship with managers and colleagues, and prospect for development. Each element donates to a worker’s general sense of contentment with their workplace and job. When conditions such as discussed previously as the environment of the workplace, managers and colleagues, high incomes, or the worker’s particular outlook cause the worker to turn into discontented with the work and lead them to put less effort in their job substantially, emotionally, or expressively (Noe, et al., 2006). If staffs are dedicated to a business, they are further probable to be highly efficient. Organisational commitment as explained by (Egan, et al., 2004) is a state in which staffs trust in and consent with organisational purposes and wish to continue working with the company. Investigation has exposed that job gratification and structural commitment incline to affect each other. What this discovery proposes is that individuals that are comparatively contented with their workplace will be to some extent more dedicated to the business and likewise these individuals who are comparatively loyal to the workplace are supremely probable to have superior job satisfaction. A rational allowance of organisational commitment emphases precisely on extensive commitment influences, which proposes that conclusions to continue with or depart from the workplace eventually are imitated in worker absence and turnover data. Individuals who are not much contended with their work or who are not as dedicated to the workplace are utmost probable to exit the workplace either infrequently through nonattendance or forever increasing turnover. Turnover is contingent on worker insights of the attractiveness and stress-free movement in the organisation. Staffs pursue to advance their work circumstances when they switch organisations. Consequently, staffs in a business advance their incomes if they find a new job afore exiting their current workplace. Guthrie (2008) identified companies salary level is a possibly vitally unswerving effect on deliberate turnover. In this information age, where salary is among the basic element, staffs exits present job and receive the job with advanced salary prospects. Consequently, there are companies analytically conscious that low salary level will outcome into increased labour turnover and departure. Salary level is not just the mere issue behind the labour turnover and departure nevertheless also, pay scheme whereby workers can be contented or discontented with the companies salary system. This is based on the superiority of staffs or per the performance assessment. Staffs are contented with current salary scheme if they supposed that recompenses or encouragements are remunerated based on equality and measured supremacy or performance assessment of each worker (Iqbal, 2010). Organisation’s concentration in employment turnover is intensely associated with the business cycle (Zeffane, et al., 2008). Under circumstances of financial weakening when the claim for employment is declining, turnover is not seen as a major issue by organisations instead it is recognised as a beneficial aspect for the success of the employees, the organisation and the public. Consequently, many years ago when the UAE economy saw instability and high joblessness degrees, one could perceive the increase of outplacement activities, mobility centers, the advertising of ‘job offers’ and the obliteration of internal employment markets. Few researchers even detected the awakening of an unemployed economy (Hurley & Estelami, 2007). In the early 90s, when the employment markets turn out to be complex and work shortage cultivated, the stress moved towards the disadvantageous effects of turnover (Egan, et al., 2004). The inevitable message of the professionals’ literature was that the expenditures of employee turnover were substantial: reaching from 50% annual incomes to 175% in case of some Information Technology and advertising specialists (Moncarz, 2009). Such journals demonstrate merely a partial attention in the costs of labour turnover and disregard other factors. Moreover, (Maertz, et al., 2007) stated that in most circumstances the statements put forward also shows deficiency in an empirical foundation. These critique intents to contribute to the empirical investigation of the impact of labour turnover on organisational profitability. The exploration literature on employee turnover is subjugated by examination in which employee turnover is deliberated as the dependent variable. Normally the investigators stress upon some empirical dimension of definite employee turnover, or they incorporate a pointer such as the purpose to switch the job. In the prior circumstances one arguments whether the pointer incorporated is appropriate or not (Combs, et al., 2006). Researchers that considered the employee turnover as an independent variable are comparatively infrequent. The journals relating to the costs of employee turnover that are obtainable frequently merely deliver a normative meaning. They frequently intend at offering diverse extents of costs and methods for how to calculate them, however commonly have deficiency of a quantitative examination on the impact towards organisational profitability (Yousef, 2000). This destabilise in the investigation of employee turnover was previously renowned in the year 1982 by a researcher who stated that ‘comparative to the reasons of turnover, significances are underemphasised’ (Yousef, 2000). In (Iqbal, 2010) unambiguously deliberated towards the probable risk of a research preparation intended on the reasons of employee turnover while disregarding its impact on the organisation: such studies are based on the statement that turnover is a significant structural difficulty and, therefore, should be condensed. Conversely, (Ramlall, 2003) in their study presented that labour turnover and departure can have disadvantageous impact on customers and continuing work employees who would have to work harder to provide and obtain quality practices when job spots are emptied and then occupied by new workers. Likewise, such turnover can carry customer’s distrust and dispirit labours from continuing to stay devoted to the business or even those looking for a job in the organisation. Furthermore, according to (O'Connell & Kung, 2007) employee turnover is expensive and uncreatively time and efforts consuming, and thus it is also accountable for the initial phase of staffing service positioning construction, resignation that is disadvantageous to the status of businesses that are going through this process. (Glebbeek & Bax, 2004), in their research carried out previously specified that the business has to experience an immense rate of expense annually due to employee turnover. Glebbeek & Bax (2004) depicted that the establishment has experienced expenditures for job posting, medical examination disbursement, phone bills for inspecting positions, travel budget, costs associated with positioning new employed staffs, transfer expenditures etc. Moreover, it is also emphasised in the study by (Glebbeek & Bax, 2004) that other non-financial standards that the business has misplaced comprising, time applied by administrators to assess the work procedure, loss of structural retention, time and cash expended for development of required skills in the freshly hired workers until they increase the anticipated degree of abilities are other foremost features that the organisation have misplaced. Higher rate of employee turnover has the propensity to carry with them decreased profitability where staffs are attentive towards the fact that their job in the particular organisation is risky. For example, staffs that are not under extreme management offer higher efficiency than those in extreme administration (Suliman & Al Obaidli, 2011). Employment safeties diminish the distress that stops the employees from offering entire assurance to the workplace (Hurley & Estelami, 2007). The job attainment discussion rest upon the vital interrogation on the level of worth the business situates on steadiness of occupation in its general viewpoint. Whether administrations actually consider that job constancy offers the organisation a competitive edge is unwavering by their degrees of employee turnover, perceptibly, where job uncertainty is existent, workers incline not to offer their greatest at the work as they frequently stay in distress of losing their occupation (Ramlall, 2003). As soon as new worker come joins the workplace, they require going through the organisation’s planned training, positioning/introduction procedures. These accomplishments are prearranged at an additional budget to the association contingent on their occurrence. Though, with a low rate of employee turnover, a superior fraction of this budget could be escaped (Rettab, et al., 2009). Employee turnover results in the damage to most of the highly efficient and skilled labour force. This unfavourably distresses the business as excellence of productivity inclines to undergo the decline situation. This would consequently; take certain time for fresh workers to understand and adjust in the workplace over their particular jobs while the experienced staffs would not have to go through that procedure. In relation of profitability conversely, it is the businesses that faces the challenges and consequences (Iqbal, 2010). At a time when employee turnover rates turn out to be so distressing the community will start to fail self-reliance in the process of the businesses. The prospect or existence of the business will be in uncertainty to the community once they perceive staffs moving in and out or leave the workplace. Moreover with this understanding, the loss in community assurance can carry a difficulty in attainment of capable operations and staff to replace those who departed from the workplace. This is understandable since it is the staffs who establish what the business signifies through the transfer of excellence in productivity or service to the community. Besides if these similar staffs have indeterminate prospect in the business then stresses will certainly be elevated (Suliman & Al Kathairi, 2012). Dissimilar authors reach agreement that the cost associated with hiring new employees is equivalents to 1 to 3 times the yearly income and welfares overall plus the supplementary cost of declined profits that the experienced worker would probably have produced. The major purpose that staffs voluntarily depart from their workplace is not the organisation or their job but specifically the higher management. Investigators moreover contended that remuneration, career development, welfares and profession fitting are foremost aspects for why staffs retain or depart from an organisation (Yousef, 2000). And worker retaining are connected to administrators performance for the reason that, they need more participation in decision making, added gratitude, superior interaction, enhanced team-building, flexibility in the job, further independence and improved training (Yousef, 2000). The researcher has faced the issues related to deliberating more on the subject matter in context of UAE. Though the questionnaire and survey has presented with the current scenario of employee turnover and organisational performance, however, the prior literature in this area are more concerned towards western world or global context. There is very little amount of literature present on the settings of employee turnover and its impact on organisational profitability in context of UAE. Thus, this remains the literature gap in this research. This chapter has discovered the notions of employee turnover through the understanding of various aspects associated with it that are studied by prior researchers. It has further studied the relationship between the two variables that are the Employee turnover and organisation profitability. Through the critical analysis and review of the theoretical literature it is understood the majority of the literature believes that there is a significant relationship between employee turnover and organisational profitability. This link between the two variables explains that if there is high degree of employee turnover in an organisation then the profitability will experience a decline. Moreover, the researcher has provided with ample empirical study on the subject matter and developed a conceptual framework on Employee turnover. It has finally provided with the literature gap that is absence of significant study of this issue in context of UAE. A research philosophy is an acceptance of the technique through which data related to a phenomenon must be collected, examined and used. It is an over-arching matter associated with the increase of information and understanding and the nature of that information. The term epistemology; that is the acceptance of information said to be true, as contrasting to doxology; that is believe of information to be true, comprises the numerous philosophies of research method. The research philosophies entail four kinds such as pragmatism, positivism, realism, and Interpretivism. Pragmatism: this philosophy consents on theories to be applicable only if those theories are supporting action. Pragmatics identify that there are various dissimilar techniques of understanding the world and completing a research, and realising that each perspective and opinion is different from the other and they can never provide with a complete description and that there can be numerous realities. Positivism: follows the opinion that only “genuine” information that is proven to be a fact is extended through observation, comprising quantity, is reliable. In positivism researches the part of the investigator is restricted to data collection and analysis which has to be done by the means of objective approach and the study results are generally evident and measurable. Positivism is contingent on quantifiable explanations that head towards statistical analysis. It is also identified that as a philosophy, positivism is associated to the pragmatist interpretation that information stems from social understanding. It attains an atomistic, ontological outlook of the world as encompassing distinct, apparent fundamentals and actions that interrelate in an evident, firm and consistent way. Interpretivism: also recognised as interpretivist includes investigators to understand fundamentals of the research, therefore Interpretivism incorporates human concern into the research. Consequently, interpretive investigators undertake the access to truth (provided or socially accepted) is only through communal structures such as language, awareness, collective values, and mechanisms. Thus, with following understanding of the research philosophies it is concluded that the following research will employ the positivism philosophy to carry out the purpose as it requires providing quantifiable or measureable outputs. While carrying out a research it is important that the researcher select appropriate method of collecting data so that the research is highly comprehensible and reliable. There are two approaches used while preparing a report that are deductive and inductive approaches. A deductive approach distresses upon generating hypothesis depending on the prevailing theory, and then planning a research plan to assess the hypothesis (Hancock et al., 2011). This approach can further be elucidated through hypotheses that can be generated or taken from the suggestions of the theory. In simple understanding, deductive approach distresses upon abstracting assumptions from evidences or suggestions. It has been specified that deductive means rational from the specific to the broad-spectrum. If a fundamental association or connection appears to be indirect by a specific theory or instance, it might be factual in numerous circumstances. A deductive intention might assess to comprehend if this association or relation did acquire on further wide-ranging conditions. On the other hand, Inductive approach, also recognised as inductive perceptive, initiating with the explanations and philosophies are projected towards the conclusion of the investigation procedure as an outcome of explanations. Inductive research comprises the exploration for design from reflection and the progress of justifications – theories – for those designs through list of hypotheses. No theories or hypotheses would relate to inductive researches on the initial stages of the investigation and the researcher is allowed to change the course of the research after the research procedure had begun. So, with the following understanding the researcher has selected the Deductive approach for this research. This approach will help in assessing the number of elements that impacts the organisational profitability and the productivity of the employees in the dynamic and competitive marketplace. There are two main types of research methods which are used by researchers to collect appropriate data according to the purpose of the research. These methods include Quantitative and Qualitative methods (Thanasegaran, 2009). The Quantitative research method is defined as a degree or level of occurrences substructure on the statistics and quantities. Furthermore, the queries of “how many?” and “how frequently?” are frequently examined under this research method (Kanyurhi and Bugandwa Mungu Akonkwa, 2016). Surveys and close-ended questionnaires are acknowledged methods of Quantitative approach which are statistically analysed (Neuman, 2002). On the other hand, Qualitative Research methodology is informative and aims to deliver a profundity of information. It is based on words, insights, outlooks etc. and not on statistical data and they comprise observations, interviews, focus groups, and open-ended surveys where respondents are free to express their understandings. However, the researcher has selected the quantitative research method for the following study which will help in providing with measurable data that are reliable and provide accurate and specific amount of result. Primary and secondary data collection methods are the two data collection, method that is usually utilised in the research study. For this research study, both primary and secondary data collection method has been utilised. Primary data provide opportunity to the researcher to collect the first hand information and secondary data collection method is focused on extracting material from the work of other writers. For this research, primary data has been collected through closed ended questionnaire. For the secondary data, journal articles and research publications has been utilised by the research personnel and websites, books and search engines have been used. The aim of this study is to find out the impact of employee turnover on organisational profitability. Therefore, to acquire the data researcher designed close-ended Questionnaires. Survey questionnaires were circulated among 80 employees of 5 different organisations operating in the UAE. 16 survey questionnaires were distributed among the employees of each company and the participants were not selected in a random manner in these companies. The questionnaires were established upon pre-conceived subjects connected to employee turnover and organisational profitability. The concerns related to research reliability and validity is essentially required to be addressed in the following section in a brief way. Reliability is defined as a degree to which the similar responses can be attained using the similar instruments more than once. It is significant for the research to show consistent results or else it will consider as a failure towards testability and the research will be considered as inappropriate. The researcher has checked the reliability of this data through computing the correlation between varying measures and provided with the reliability result. On the other hand, validity is the strength of the assumptions, interpretation or suggestions of the research. More specifically, (Thanasegaran, 2009) describe it as the "paramount obtainable estimate to the fact or falsity of a particular interpretation, suggestion or assumption." There are 2 extensive methods of validity that are external and internal. External validity is the degree on which the outcomes of an analysis are comprehensive through a sample to a population. Conversely, internal validity is defined as the relevance of the content of an instrument and thus assesses questions, surveys etc. The sample size of the following research is 80 employees working in different organisations based in UAE. Sampling is separated into two major method that is non-probability and probability sampling. The probability sampling method comprises sequential sampling, stratified sampling, cluster sampling and the random sampling whereas the non-probability sampling method comprises sampling ways of quota, purposive, consecutive, and convenient sampling. The non-probability sampling is employed in the following research where the all the individuals from the selected targeted audience will not be provided with equal opportunity of getting selected while probability sampling is based on random selection. The research took place in the service sector to evaluate the effect of employee turnover on organisation profitability. The aim behind implementing convenient sampling is that the respondents were chosen based on their convenient availability and proximity to the researcher. Data analysis is among the major aspects of completing a research. It is significant to implement appropriate data analysis tools in order to attain the credibility of the research. Moreover, the appropriate use of data analysis techniques assisted the researcher in measuring the research precisely and efficiently. Microsoft Excel as well as SPSS statistical tools were incorporated in analyses the data in this research. The reasoning behind incorporating the following analysis tools is that they delivers appropriate and reliable results in a simple manner that helps the reader in comprehending the research results effectively. Furthermore, the researcher has also incorporated the descriptive analysis method in order to test the answers of the participants. Likewise, the analyses of the data are presented through table, diagrams and figures that will further help the reader in comprehending the subject matter easily. The Regression analysis technique is incorporated in order to measure the collected data. Ethics refers to the standards or values identified to conduct a research while being able to differentiate between right actions and wrong doings (Scandura & Williams, 2000). So, the researcher has highly aimed at completing the research in a manner that is acceptable by the society and research standards. Plagiarism and informed consent is amongst the major issues that were faced in this research study. Therefore, special care has been taken to avoid the issue of plagiarism. Furthermore, informed consent has been taken by the participants prior to their inclusion in the research study. The following research has been completed through quantitative research methodology. The sample size was 80 respondents that are working in different organisations of UAE and the respondents were selected through non-probability sampling technique. The research philosophy is positivism philosophy along with the deductive research approach. Moreover, the data is collected on a ratio of 80:20 that means primary as well as secondary both data collection methods are used so the data has been gathered through close-ended questionnaires along with secondary methods of reviewing journal articles, websites and books. Moreover, the analysis of the data took place through SPSS and Microsoft Excel. In all this process, the researcher aimed that working through the accepted ethics of conducting a research and avoided violating any code. This chapter entails the interpretation of the result based on the descriptive statistics. This chapter furthermore includes the interpretation of regression analysis of the collected data. As per the above graph, it is depicted that the 11% of the participants were on the neutral when they were inquired about the strong impact employee turnover on the profitability of the company. 38% and 37% of the employees agreed and strongly agreed that the employee turnover has huge impact on the profitability of the organisations in UAE. 9% and 5% participants disagreed and strongly disagreed with the statement. 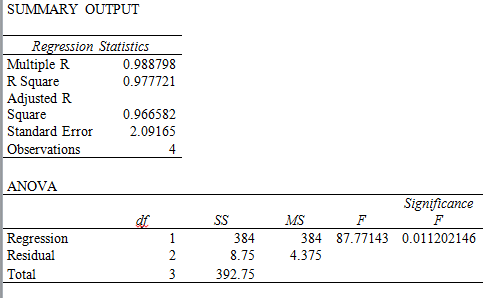 On the other hand, the above table is depicting that the standard deviation and mean has minor difference indicating that the data is reliable and the statement is true which implies that the employee turnover has strong relation on the profitability of the business. The above graph is depicting that 38% of the participants strongly agreed that the employee turnover can easily limit the profitability of the business. 35 % of the participants agreed that the employee turnover has can easily limit the profitability of the company. 12% of the participants provided neutral response on the statement. 9% of the participants disagreed with the statement and 6% of the participants strongly disagreed with the statement. The above table on the other hand is depicting that means and standard deviation are close which means that the statement is true that is employee turnover can easily limit the profitability of the business in UAE. Furthermore, since the standard deviation is close to the mean which means that the data is reliable. The above graph is depicting the response on the factors that can contribute to the increase and decrease in the level of employee turnover. The graph is depicting that 29% of the participants strongly agreed to the statement. 37% of the participants agreed that there are certain factors that can easily and decrease the level of employee turnover. 14% of the participants provided neutral response to the statement. 11% and 9% of the participants disagreed and strongly disagreed with the statement. 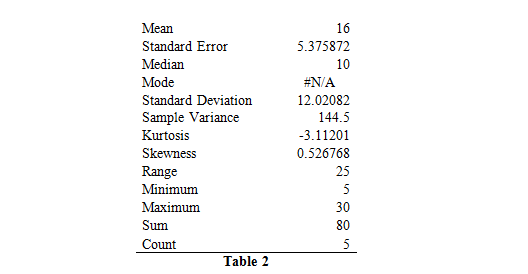 The above table is supporting the reliability of the responses as the standard deviation is close to the mean which is indicating that the data is reliable. The above graph is depicting the responses of the participants on the training and development as the most important factor that is associated with the employee turnover.35% of the employees strongly agreed to the statement. The graph is also depicting that 39% of the participants agreed with the statement. 13% of the participants were neutral in providing the responses.7% of the participants disagreed with the statement. 6% of the participants strongly disagreed with the statement. It means that training and development is amongst the most important factor in the employee turnover in the organisations of UAE. The above table is indicating that the values of mean and standard deviation are closely related which is indicating that the data that is represented in the table is reliable hence depicting that training and development is amongst the most important factor in the employee turnover in the organisations in UAE. The above graph is depicting the responses of the participants on the job satisfaction as the main factor in employee’s turnover. As per the above graph, it is depicted that 11% of the participants has provided neutral response to the statement. 43% of the participants strongly agreed to the statement and 31% agreed to the statement. However 11% of the participants disagreed and 4% strongly disagreed with the statement. The result from the graph is indicating that job satisfaction is amongst the main factor in the employee turnover in UAE organisations. 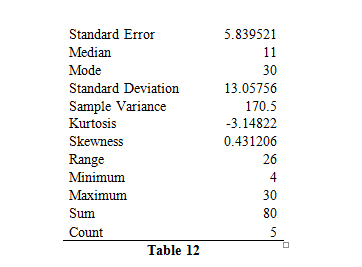 The table is indicating that that there is less difference between the standard deviation and the means which is depicting that the data is reliable. As per the above graph, it is depicted that organisational commitments can easily influence the employee turnover ratio. The above graph is depicting that 15% of the participants provided neutral response on the statement. 10% and 9% of the participants disagreed and strongly disagreed with the statement. 34% and 32% of the participants agreed and strongly agreed that the organisational commitment can easily influence the employee turnover ratio. 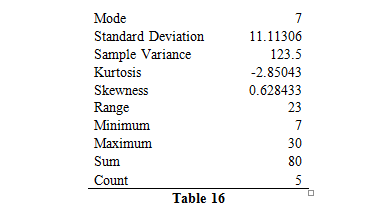 The above table is indicating that there is a difference between the mean and standard deviation. However, considering the statement, the difference is not indicating that the data is discrete. As the standard deviation is close to zero, it is indicating that the data is reliable. The above figure is indicating the response on the factor of remuneration and its effect on the employee turnover. The graph is depicting that 11% participants provided the neutral response. 41% and 33% of the participants strongly agreed and agreed to the statement. However, 8% of the 7% of the participants disagreed and strongly disagreed with the statement. The table is also depicting that the above figure is reliable as the difference between the mean and standard deviation is less which means that the data is not discrete. 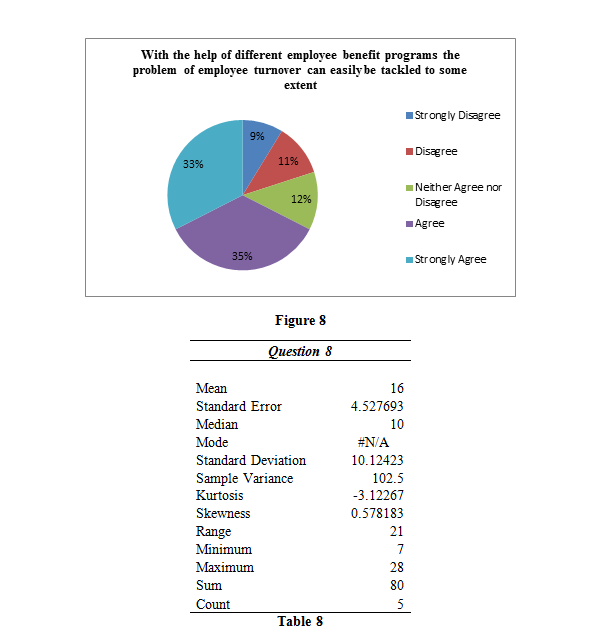 The above table is indicating that 12% of the participants provided neutral response when they were inquired about the employee benefit program and its positive impact on employee turnover. As per figure, it is depicted that majority of the participants agreed and strongly agreed with the statement that is 35% and 33%. 11% of the participants disagreed with the statement whereas 9% of the participants strongly disagreed with the statement. The above table is also validating the reliability of the data as the standard deviation is favorable that is it is close to zero and there exist minimum gap between standard deviation and mean. 18% of the participants provided neutral response when they were inquired about the low salary level and its negative effect on the employee turnover rate as per the above graph. The graph is also depicting that 39% of the participants strongly agreed with the statement and 31% of the participants agreed with the statement. It means that low salary level has negative impact on the employee turnover rate in the organisations of UAE. 6% of the participants disagreed and strongly disagreed with the statement. The above table is depicting the same result as the mean and standard deviation are close, hence depicting that the data is reliable and the low salary level does has negative impact on the employee turnover and departure. The above graph is depicting the responses on the impact of motivated employees on the success of the organisation in UAE. As per the graph, 11% of the participants provided neutral response to the statement. 34% of the participants strongly agreed and agreed with the statement. 10% of the participants disagreed and 9% of the participants strongly disagreed with the statement. The table is supporting the responses as the table is depicting that data is not discrete and hence it is reliable which means that the difference between the standard deviation and mean is less. As per the above table it is indicated that 31% of the participants have strong agreed that the top management can easily manage the avoidable worker turnover in the organisations of UAE. The graph is depicting that 36% of the participants agreed to the statement. 13% and 5% of the participants disagreed and strongly disagreed with the statement. The table is depicting that the standard deviation is close to zero which is depicting that the standard deviation is feasible. It means that the data is reliable despite of have difference between mean and standard deviation. The above graph is depicting the responses of the participants on fact that the management has less or no control on the unavoidable worker turnover. The above graph is depicting that 14 % of the participants provided neutral response on the statement. 5% and 6 % of the participants disagreed and strongly disagreed with the statement. Whereas 38% and 37% of the participants strongly agreed and agreed with the statement respectively, that management has less control over the unavoidable turnover. The above table is depicting that there is less difference between the mean and standard deviation hence depicting that the data is not discrete and is reliable. The above graph is depicting that 12% of the participants provided neutral response when they were inquired about the increase in employee turnover ratio can create problem for organisation for enhancing the profitability of the organisation of UAE. 33% of the participants and 36 percent of the people from the selected sample strongly agreed and agreed with the statement. 10% of the participants and 9% of the participants disagreed and strongly disagreed with the statement. The above graph is indicating that the standard deviation is favourbale as it is close to zero and hence depicting that the data is reliable. The above graph is depicting the response of the participants on the departure of skilled and competent worker and difficulty in the replacement. The above graph is indicating that 11% of the participants provided neutral response to the statement. 39% of the members strongly agreed with the statement whereas 32% of the members agreed to the statement hence implying that the departure of skilled and competent worker is quite difficult to replace. 9% of the participants disagreed and strongly disagreed with the statement. The above table is depicting that the data is reliable and as the difference between the mean and standard deviation is less. The above graph is depicting that that 35% of the participants agreed to the statement when they were inquired about the higher level of turnover is associated with the greater expenditure. 31% of the participants strongly agreed with the statement. 14 percent of the participants gave neutral response and 10% of the participants disagreed and strongly disagreed with the statement. 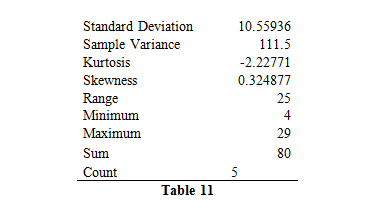 The table is indicating that the standard deviation is depicting low value which is closer to zero and depicting that the standard deviation is favourable. The above graph is depicting that9% of the participant’s negative response and disagreed and strongly disagreed with the statement respectively. 12% of the participants provided neutral response where as 38% of the participants strongly agreed and 3% of the participants strongly agreed to the statement. It means that form the outlook of the organisations of UAE, employee turnover can be quite costly. The table is supporting the reliability of the data as the difference between mean and standard deviation is less. 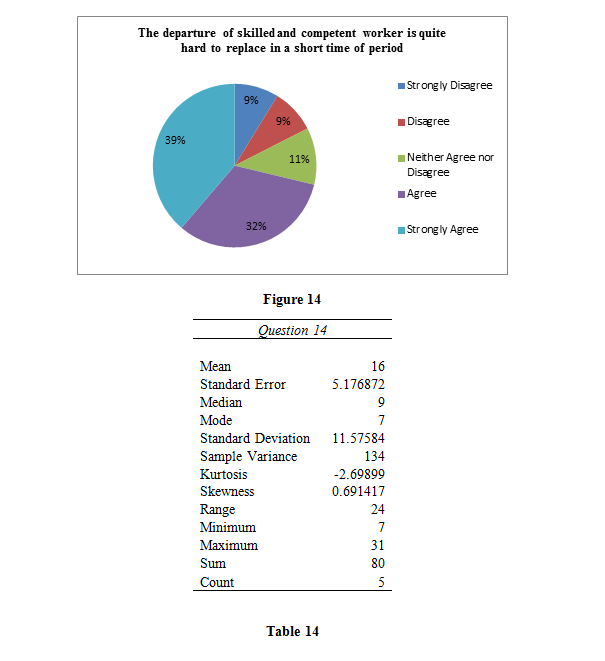 The above table is depicting the regression analysis on the data that has been collected for this research study. The table is depicting that since the significance value is greater than 0.005, it means that the employee turnover is not much affected by the factors. However, it is not implying that the employee turnover is not affected by any of the factors but it is suggesting that employee turnover is affected by the factors but the impact of such factor is not significant. It means that the factors such as environment salary and fringe benefits do have the impact on the turnover rate but the impact is not significant in some organisations of UAE. It is analysed from the above results and literature that there is a strong impact of employee turnover on the profitability of the organisation. Consequently, it is imperative from the viewpoint of the higher officials of an organisation to design effective strategies and policies in order to manage with the perplexing condition of employee turnover for the reason that it affects the profitability of a business in a negative manner. Furthermore, it is a core responsibility of the top officials of UAE to take effective measures that would support them to reduce the problem of employee turnover effectively. However, it is noted that there are certain issues that are connected with the problem of employee turnover and these factors includes training and development, job satisfaction, organisational commitments, remunerations and benefit programs. It is examined that the training and development is one of the most important factor that is associated with employee turnover and must be considered by the higher management of an organisation. Moreover, it is found that in UAE most of the organisations invest adequate amount of money particularly for providing effective training to their employees that enhance their productivity level to the utmost level. Currivan (2010) stated that employees are the most important asset of any organisation that plays an imperative part in the success of a business. For this reason, it is a prior responsibility of the HR department of an organisation to formulate appropriate policies and strategies in order to encourage their employees towards the attainment of organisational goals and targets in a consistent manner. Furthermore, another important factor that is linked with the problem of job satisfaction and it is considered as the most vital component which affects the overall performance of employees in both ways positive and negative. Therefore, it is important for the long term success of an organisation that they should consider this factor at the time of making and implementing new policies because increase in employee turnover would ultimately create problems for the business to flourish with the rapid pace (Iqbal, 2010). It is evaluated that with the help of effective remunerations and employee benefit programs the problem of employee turnover can easily tackle. For that reason, most of the large scale businesses invest adequate amount for the purpose of improving their employee benefit programs because this is the best way through which they can easily make their employees happy and satisfied. According to Koys (2010) due to the cutthroat competition it is quite difficult for every single business to remain stable and run their business operations smoothly. Therefore, they must have team of competent employees that are willing to play their part towards the attainment of organisational strategic goals and targets. However, the role of top management of an organisation is very crucial because they are responsible to provide healthy working environment to their employees and improve their performance to some extent. Maertz et al. (2007) Stated that due to the increase in the employee turnover ratio it create problems for the managers to manage their work viably. Therefore, the role of managers is also very important in the process of reducing the employee turnover ratio and they should encourage their co-workers by giving them non-financial motivation. It has been observed from the findings of Dess & Shaw (2012) study that increase in the employee turnover ultimately affect the effectiveness of the business operations in a negative manner and decrease in the employee turnover ratio would ultimately enhance the overall efficiency of the business operations. For that reason, it is important from an organisation prospect that they must have team of motivated employees that are able to perform difficult task without any direction and assistance. It is evaluated that the role of top management is very imperative in the process of executing effective remuneration and benefit programs for their employees for the reason that they are responsible to execute the paper plans practically. However, in order to get the competitive edge over their competitors it is important for an organisation that they must have team of motivated employees that are able to work in a complex situation. It is noted that the problem of employee turnover make it difficult for the businesses to accomplish their strategic goals and targets in a consistent manner. Therefore, it is important for a long term success of an organisation that they should formulate appropriate policies and strategies in order to tackle the problem of employee turnover to some extent. However, the high proportions of turnover lead to greater costs associated to employing and training and developing new workers. In addition, it costs organisations money to hire HR experts for the purpose of conducting an interview and hire applicants and training new workers might be an expensive procedure that distracts competent employees from revenue-generating operations. Furthermore, competent employees who have to often train new employs are less capable to focus on their normal job. Therefore, it is quite difficult for every single business to manage its business operations effectively that faces the problem of employee turnover (Suliman & Al Kathairi, 2012). It has been observed from previous researches that a loss of every single employee would cost around fifty percent of the worker’s yearly pay. Moreover, every time a worker leaves the organisation, it presumes that the output falls due to the erudition curve intricate in comprehending the work and the firm. In addition, the cost of intellectual resources adds to this cost, from the time when not only do firms lose the relational and human capital of the leaving worker, but also contenders are possibly attaining these resources viably. For this reason, if employee turnover is not accomplished appropriately then it would definitely disturb an association unfavourably in terms of workers expenditures and in long haul it would distress its liquidity place. It is noted that, voluntary turnover results in adequate cost, both in terms of direct and indirect cost which includes temporary staff, pressure on other employees, cost of learning and the most important loss of social resources (Suliman & Al Obaidli, 2011). This chapter was focused on providing the results on data that is collected through closed ended questionnaire. The next chapter will include the conclusion and recommendation for the topic under consideration. The human resource has taken dynamic shift over the past few decades and has highlighted a number of issues that can cost time and money to organisation. Employee turnover has been the most discussed issues amongst the managerial issues throughout the world. Employee turnover is very high even in the developed nations that have well established human resource practices. Employees normally leave the organisation when they are not content with the work environment or the work they are doing. The employees can only perform in the organisation when they are satisfied with the work environment. In the organisation, employee turnover is the main issue that has major impact on the performance of organisation and therefore also impacts the profitability of the organisation (Combs, et al., 2006). This research study has concluded that higher turnover rate tends to decrease the profitability of the organisation. The higher turnover rate accounts for higher cost that is incurred in the recruiting and training of the employees. The cost is incurred to the business in hiring the human resource, conducting interviews and proving training to the new resource that is hired. The hiring incurs the cost of recruiting the employees and conducting interviews. The training is all over the costly process for employees as the training process diverts the skilled workers from the activities that can generate revenue towards training of new employees. The experienced workers who are continuously engaged in training new employees are less able to concentrate on their jobs. This costs the employer not only the time but also the resources thus contributing towards high turnover cost and decreased organisational profitability (Glebbeek & Bax, 2004). The research study concluded that the mutual effect of the negatives can result from high turnover that may cause the organisation to generate less profit. The turnover rate in general tends to increase cost, and thus anything that increases the cost or reduces productivity within an organisation tends to reduce the profit. The study therefore, concluded that the organisations that tend to have high turnover rate tends to have lower profit margin. Furthermore, the high turnover rate tends to be more costly for the start up organisations and therefore reduces the profitability of the organisations (Awadh & Ismail, 2012). As per the research study, the organisations, that are, enthusiastic to grow focus more on their human resource practices and other potentials. In the current era of innovation and continuous development, the technology and the environment has changed the rate of doing things. Organisations are therefore, focused on bringing their workforce together in order to require the intellectual and manual growth of organisation. It helps in intensifying the additional productivity of the workforce that they can generate by the employees that is hired by the organisation. This all adds up the cost of the organisation, thus making the organisation conscious of the cost in ensuring that the employees with the higher human capital do not leave the organisation. But in the reality the organisations do not always succeed in retaining their employees and therefore the organisations are required to pay the high cost. Therefore, it is often suggested that organisations should have clear operating procedures that requires the organisations to establish and implement standard operating procedures that helps in reducing the gap between the top management and the middle management for identifying and resolving the issues of employees turnover in the organisations. .Employee turnover with the organisation’s perspective is costly as when the employee leaves an organisation, the organisation is required to substitute that place with another human resource in in order to smoothly proceed with the operations. The cost that is occurred through employee turnover includes recruitment for talent, enlistment of the individuals that can be substitute of that position and to develop that person to the level at where the previous employee has left. All this adds up to the cost of the organisation and ultimately has effect on the organisational profitability. Top administration ought to make open doors for professional success in the association. Formation of chances for professional success may help staff to end up noticeably more skilled and to make the most of their work surprisingly better (Awadh & Ismail, 2012). Top administration ought to enhance working conditions inside the association. The workplace ought to be favourable for worker's wellbeing and security in the division. To persuade the workforce, it is essential to guarantee a danger free and safe condition which likewise upgrades effectiveness and profitability. At the point when the unfriendly impacts of the physical workplace are not went to by administration Employees may free enthusiasm for the work and may leave the association. Top administration ought to include workers in the basic leadership handle. Administrations ought to include Employees in any issue that will influence them in the association. Worker inclusion might be through meeting with their agents. Top administration ought to create worker help programs in the association to help workers with issues to kill truancy or staff turnover. Best administration ought to likewise ensure that workers know about these projects in the association. Top administration ought to likewise value Employee's contribution to the association when they meet hierarchical objectives. Gratefulness can be through declaration or composing a letter of honour and setting it in the notice board or give a few impetuses (Rettab, et al., 2009). Top administration ought to lessen work weariness to Employees by returning to Employee's expected set of responsibilities keeping in mind the end goal to include some test work errands the worker's expected set of responsibilities. In the event that there is no match between workers what's more, the occupation, the workers end up plainly exhausted by the employment that gives no difficulties or one that gives impossible difficulties. These truths are the ones that make individuals leave the association. Top administration ought to give acceptance and introduction to new workers with a specific end goal to decrease to much wastage of assets. Giving preparing to new workers will help in the diminishment of wastage of assets while the new staff part settles in. Administration ought to guarantee that compensations polices are explored every now and again to lift workers moral. Management ought to build up a general vital pay bundle to workers to fill in as a motivational device for Employees (Suliman & Al Obaidli, 2011). The association ought to guarantee that, there is helpful workplace to improve effectiveness (Maertz, et al., 2007). Top administration ought to lessen staff turnover keeping in mind the end goal to make strides hierarchical profitability by holding the best workers. In this manner, quality of administration conveyance will be enhanced inside the UAE organisation (Lee, et al., 2004). Top administration ought to enhance benefit conveyance inside the association. It is declared that staff turnover may effectively affect benefit rendered by the association and these may acquire shortages taking care of client demand. This prompts client bothering and increment in protests (Iqbal, 2010). Top administration ought to give benefits that will draw in the best workers to stay in the association so as to enhance benefit conveyance. Adjusting worker compensation to Employee employment obligations will help in spurring workers to enhance their execution. Top administration ought to build up an execution standard for Employees keeping in mind the end goal to gauge worker execution. Poor administration conveyance comes about in loss of clients in the association. Administration ought to thusly ensure checking the administration gave to the clients in request to enhance consumer loyalty (Iqbal, 2010). Top administration ought to guarantee that a sensible pay is paid to workers in the association. Best administration ought to pay a market related pay to workers with a specific end goal to keep them from moving to other associations. It is alluded to all types of monetary returns and unmistakable advantages that Employees get as a feature of their compensation bundle (Iqbal, 2010). Top administration ought to enrol more Employees to close the hole left by past Employees with a specific end goal to diminish work worry to present workers furthermore, to lessen additional time. Beat administration ought to support cooperation inside the association to enhance hierarchical viability. Beat administration ought to give preparing to new staff individuals keeping in mind the end goal to lessen wastage of assets when new staff settles in and at the same time to enhance nature of administration of organisation in UAE (Combs, et al., 2006). The limitations of this research study is that the research was conducted keeping the minimum sample size in the organisation. Hence the sample size was small; the research cannot be applied to the large number of population in UAE. A quantitative approach was utilised in this examination and surveys were used to gather information from the respondents. In this review, the lion's share of respondents had diverse suppositions on staff turnover and profitability of the organisation. Furthermore, there is additionally need to direct further research which can concentrate on worker maintenance systems. Additionally research should be possible in this field of contemplate utilising subjective strategies. Subjective strategies could permit the specialist to utilise meetings to gather rich information from the respondents. Different researchers could additionally examine their exploration with other organisations of UAE for gaining deep understanding of the topic. Ali, I. et al., 2010. Corporate social responsibility influences, employee commitment and organizational performance.. African journal of Business management, 4(13), p. 2796. Awadh, A. & Ismail, W., 2012. The impact of personality traits and employee work-related attitudes on employee performance with the moderating effect of organizational culture: the case of Saudi Arabia.. Asian Journal of Business and Management Sciences., 1(10), pp. 108-127. Combs, J., Liu, Y., Hall, A. & Ketchen, D., 2006. How much do high‐performance work practices matter? A meta‐analysis of their effects on organizational performance.. Personnel psychology, pp. 501-528..
Egan, T. M., Yang, B. & Bartlett, K. R., 2004. The effects of organizational learning culture and job satisfaction on motivation to transfer learning and turnover intention.. Human resource development quarterly, pp. 279-301..
Glebbeek, A. C. & Bax, E. H., 2004. Is high employee turnover really harmful? An empirical test using company records.. Academy of Management Journal, pp. 277-286..
Hurley, R. F. & Estelami, H., 2007. An exploratory study of employee turnover indicators as predictors of customer satisfaction.. Journal of Services Marketing, pp. 186-199..
Ibrahim, M. & Perez, A., 2014. 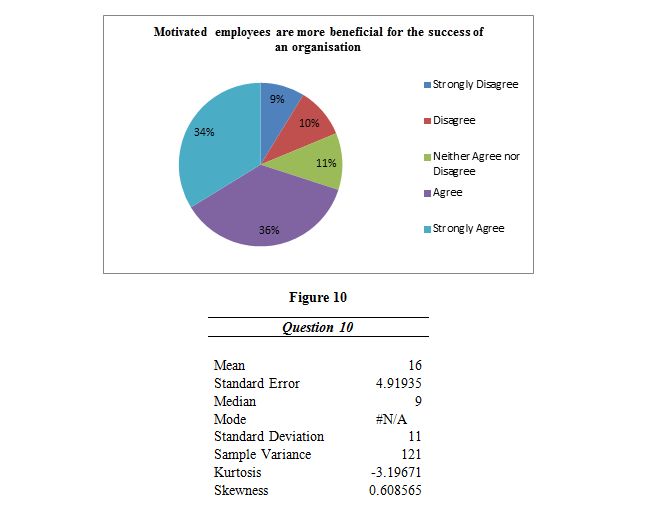 Effects of organizational justice, employee satisfaction, and gender on employees' commitment: evidence from the UAE.. International Journal of Business and Management, 9(2), p. 45. Iqbal, A., 2010. Employee turnover: Causes, consequences and retention strategies in the Saudi organizations.. The Business Review, Cambridge., 16(2), pp. 275-281. Lee, T. W. et al., 2004. The effects of job embeddedness on organizational citizenship, job performance, volitional absences, and voluntary turnover.. Academy of Management Journal, pp. 711-72. Moncarz, E. Z. J. &. K. C., 2009. An exploratory study of US lodging properties' organizational practices on employee turnover and retention.. International Journal of Contemporary Hospitality Management, pp. 437-458..
Maertz, C. P., Griffeth, R. W., Campbell, N. S. & Allen, D. G., 2007. The effects of perceived organizational support and perceived supervisor support on employee turnover.. Journal of Organizational Behavior, pp. 1059-1075..
Neuman, L. W., 2002. "Social research methods: Qualitative and quantitative approaches.". Noe, R. A., Hollenbeck, J. R., Gerhart, B. & Wright, P. M., 2006. Human resource management: Gaining a competitive advantage..
O'Connell, M. & Kung, M. C., 2007. The Cost of Employee Turnover.. Industrial Management. Ongori, H., 2007. A review of the literature on employee turnover..
Ramlall, S., 2003. Organizational application managing employee retention as a strategy for increasing organizational competitiveness.. Applied HRM Research, pp. 63-72..
Rettab, B., Brik, A. & Mellahi, K., 2009. A study of management perceptions of the impact of corporate social responsibility on organisational performance in emerging economies: the case of Dubai.. Journal of Business Ethicsl, 3(89), pp. 371-390. Scandura, T. A. & Williams, E. A., 2000. Research methodology in management: Current practices, trends, and implications for future research.. Academy of Management journal, pp. 1248-1264..
Suliman, A. & Al Kathairi, M., 2012. Organizational justice, commitment and performance in developing countries:. The case of the UAE. Employee Relations, 35(1), pp. 98-115. Suliman, A. & Al Obaidli, H., 2011. Organizational climate and turnover in Islamic banking in the UAE.. International Journal of Islamic and Middle Eastern Finance and Management, 4(4), pp. 308-324. Thanasegaran, G., 2009. Reliability and validity issues in research.. Integration & Dissemination, pp. 35-40..
Yousef, D. A., 2000. Organizational commitment: A mediator of the relationships of leadership behavior with job satisfaction and performance in a non-western country.. Journal of Managerial Psychology, pp. 6-24..
Zeffane, R., Ibrahim, M. & Al Mehairi, R., 2008. Exploring the differential impact of job satisfaction on employee attendance and conduct: The case of a utility company in the United Arab Emirates.. Employee Relations, 30(3), pp. 237-250.